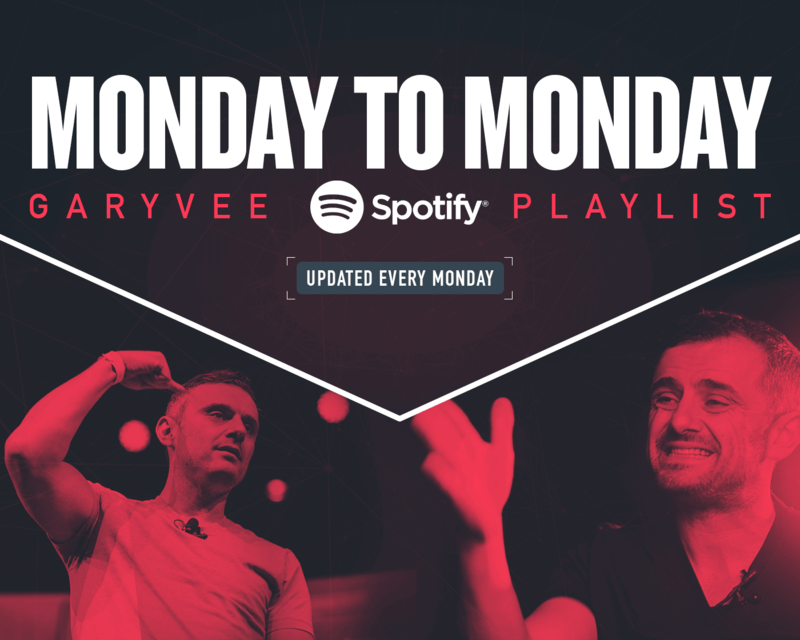 I’ve launched a public Spotify playlist called ‘Monday to Monday.’ Each week, Mike Boyd and I create a playlist exclusively on Spotify that includes 15 new tracks to showcase what I’m listening to and think you should be listening to. It’s the perfect way for me to show love to up-and-coming artists and pay my respects to the classic hip-hop legends I grew up with. I review and approve every playlist before it goes live and do my best to spend time with these artists at VaynerMedia or in the studio when I can. If you aren’t familiar with my lifelong love and respect for hip-hop, take a quick second to watch my meetings with A$AP Ferg, A-Boogie, Logic, Russ, Kyle, T-Pain, GoldLink, Jeezy, Redman, Nipsey Hussle, Big K.R.I.T., Rich the Kid and smaller artists like Yung Bans and Anik Khan. This playlist is meant to showcase hot new artists and some who have already cemented their place in the music world. You’ll find household names from Future to Kendrick and up-and-coming musicians like Gunna, Lil Baby, Gashi and more. The playlist is primarily hip-hop with some pop, R&B, indie rock, international hits, and classics thrown in to mix it up. Whether you think we are “qualified” to talk about music or not, doesn’t matter. The intent is to share interesting content in a new way around a subject we love. My POV will continue to be honest and my attention to detail ruthless because this playlist is super important to me. As an entrepreneur that has spent every second of my career reverse engineering where consumer attention actually is, there’s no doubt to me that music–hip hop primarily–plays a massive role in shaping culture, how we behave, and what we consume.
. Like new music from mainly up and coming 🔥? – Click the link in my profile and subscribe to my play list which updates every Monday. – Also leave a comment if you have already subscribed or you just did now by saying “just did” or “already on” I’ll pick a winner form each camp. – Tag an artist I should add to next weeks list . – Also follow @mikeboydjr who’s my homie on this project. ‘Monday to Monday’ is an inside look into a private playlist Mike Boyd and I have continually updated and swapped with one another over the past 4-5 years. This playlist wouldn’t be possible without Mike, who has constantly put me on to new artists throughout the years and has been the first to let me on to things–whether it was the conversation that Tity Boi was going to change his name to 2 Chainz and go on a game changing run starting with his mixtape in 2010, or how Kendrick was about to become a star after releasing his Section.80 project in 2011, or even how a high school student from St. Louis going by the name of Metro Boomin was starting to infiltrate the Atlanta rap scene in 2011. Mike first moved to New York City to work at a record label, but when we met, he decided to work for me instead. He also manages music producer Richie Souf, who is currently working with Future, Young Thug, Gunna, Young Nudy, and a lot of emerging Atlanta artists. When the artist Saba mentioned me in his song “Monday to Monday,” I thought why not make this playlist public and name it that? After all, his song encapsulates my always-on “Monday to Monday” work ethic, energy and mentality. Going back and forth with Mike and giving my final approval for what songs go live on this playlist has been exciting. For example, a lot of the 24hrs and Gunna tracks that you’ve been seeing as of late are my direct submissions. These two artists have my ear at the moment. I am thrilled to bring quick value to emerging artists in this new way, instead of trying to give everyone I think is hot a brand deal which is a.) hard to do, b.) takes time, and c.) doesn’t always come together for a million and one reasons. As a lot of you know, I am constantly testing new things out and trying to create content that will benefit my community, provide you with some value in your life, and give you an inside look into what I’m focusing on in my career at the moment. This playlist is a product of love. I really hope you enjoy it. If you ever want to continue the conversation, hit me or Mike on insta or twitter where we post content about the playlist and more.